A woman who is raised in a polygamous cult finds the courage to escape from the iron grip of her husband, with seven children in tow (one of whom is developmentally disabled). Once away from the compound, she is forced to start life with little to no knowledge of the outside world. 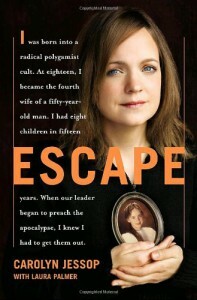 To make matters worse, her oldest teen daughter has been so completely brainwashed by the cult that she runs back to them.The FLDS group that she escapes from is none other than the one ripped from the headlines, in which several children were taken from the compound in a controversy over alleged arranged marriages between underage girls and older men.This story is a testament to the power of love that a mother has for her children.